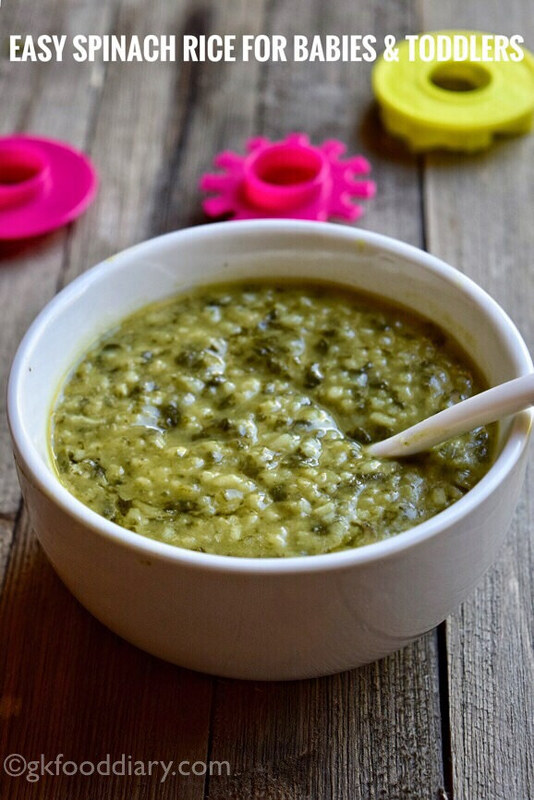 Palak Khichdi/ Spinach Khichdi/Paruppu Keerai Sadam: Easy and quick lunch recipe for babies and toddlers made with rice, lentils, and spinach. As everyone knows, spinach is a super food loaded with many nutrients. Hence it is essential to include them as part of children’s healthy diet. This spinach khichdi is a healthy and tasty option to add them to your baby and kids menu. 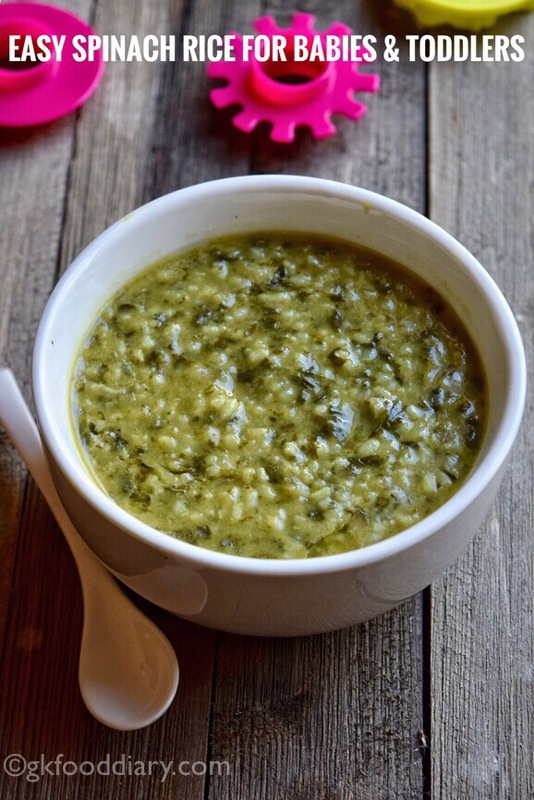 I have already shared a version of spinach khichdi for babies and kids. 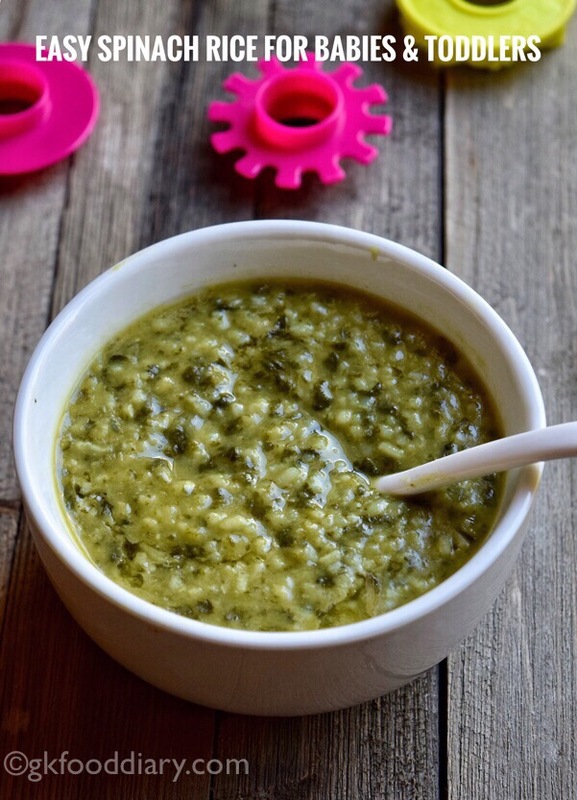 This recipe is another version of spinach khichdi with fewer ingredients & less quantity; you can make for your baby or toddler alone. 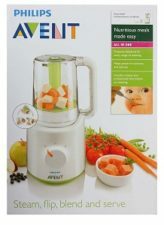 Its ideal for babies from 10 months after introducing rice, toor dal and spinach separately. 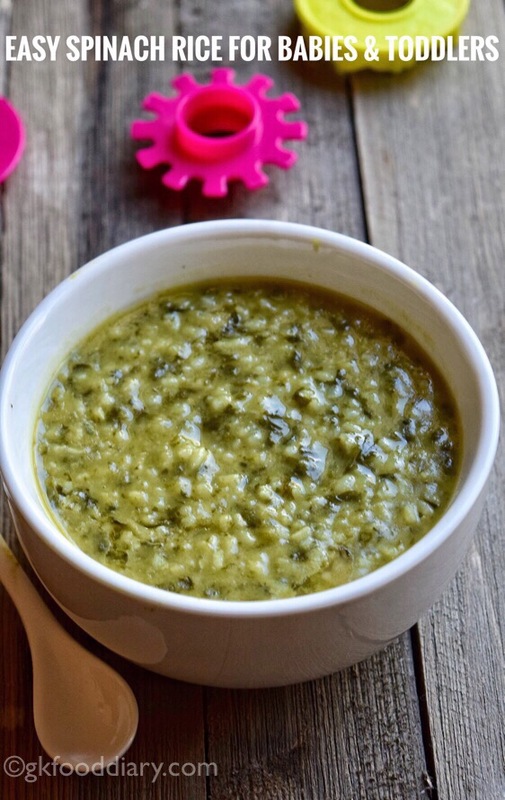 Here is how to make an easy spinach/ palak khichdi recipe for babies and toddlers. Easy Spinach Khichdi - A quick, comforting lunch made with rice, lentils, and spinach. Nutritious iron-rich food for babies and toddlers. Slice onions and garlic. Wash spinach thoroughly and keep it ready. Wash rice and toor dal together and soak it in warm water for 20 minutes. 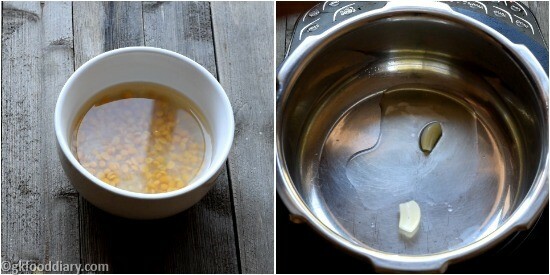 Heat a pressure cooker with a tsp of ghee. Add garlic. Then add chopped onions. Saute them nicely until transparent. Once onions become transparent, Add washed spinach leaves. Fry the spinach leaves until it shrinks. At this stage, add in turmeric powder and salt (for babies above one year). Add one cup of water and mix well. Then close the lid of pressure cooker and cook everything in a medium flame for three to four whistles. Once the pressure releases, open the cooker, mash it well with a masher until soft. You can also grind in the blender if you prefer. 1. Slice onions and garlic. Wash spinach thoroughly and keep it ready. 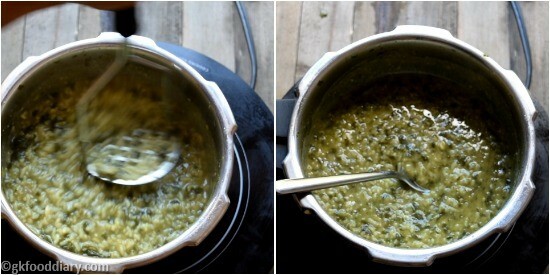 Wash rice and toor dal together and soak it in warm water for 20 minutes. 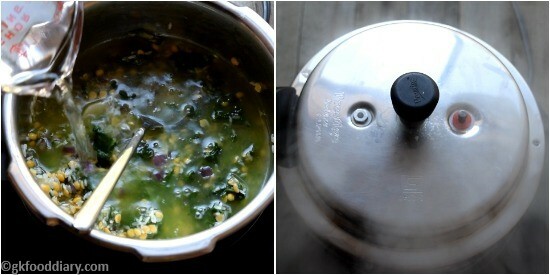 Heat a pressure cooker with two tsp of ghee. Add garlic. 2. Then add chopped onions. Saute them nicely until transparent. 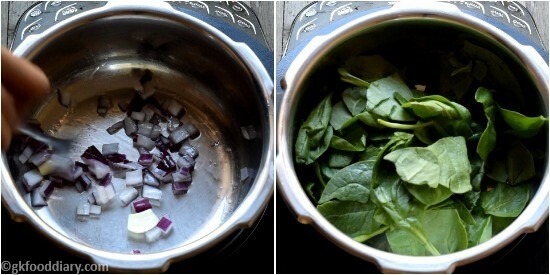 Once onions become transparent, Add washed spinach leaves. 3. 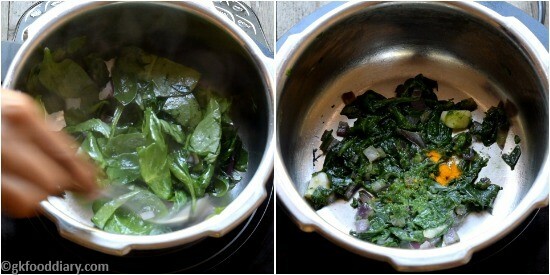 Fry the spinach leaves until it shrinks. At this stage, add in turmeric powder and salt (for babies above one year). 4. 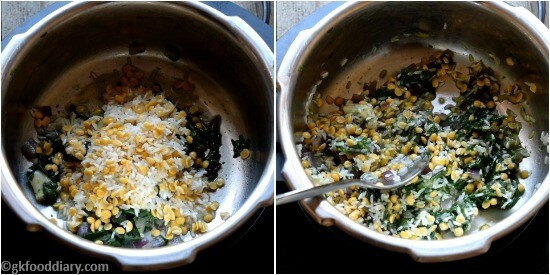 Then add soaked rice & toor dal mix well. Give a quick stir. 5. Add one cup of water and mix well. Then close the lid of pressure cooker and cook everything in a medium flame for three to four whistles. 6. Once the pressure releases, open the cooker, mash it well with a masher until soft. You can also grind in the blender if you prefer. Easy and quick spinach khichdi is ready! You can also add cumin seeds/cumin powder and one small chopped tomato to this spinach khichdi. You can replace toor dal with moong dal. Always serve spinach khichdi warm. Otherwise, it will become dry. Any regular cooking rice can be used to prepare this rice. Adjust water quantity according to the consistency your baby prefers. Make sure to introduce everything separately before you try this khichdi.